An article by James P. Byrd, promoting his new book Sacred Scripture, Sacred War: The Bible and the American Revolution recently appeared in the Washington Post. Byrd asks a very relevant question in our era: “Was the American Revolution actually a holy war?” He suggests that perhaps it should be interpreted so. The reason is straightforward enough—our nation, our culture in the United States, is so deeply steeped in scripture that even our Deist founders knew their Bibles better than many preachers today do. Byrd suggests, in his article, that people who believed in the separation of church and state could still have a deep sense of divine mission, and a belief that their war for freedom was a divine cause. Early state leaders were not anti-religious, nor über-religious. It is a balance that we would benefit from regaining. I guess I’ve seen enough political shenanigans to realize that such posturing as the Tea Party and the Religious Right or Moral Majority present are deeply cynical. The use religion as a platform to achieve political ends while conveniently slashing and burning huge swaths of biblical reasoning leaves many questions in its wake. Were such motives sincere, I would expect a lot more turning of the other cheek, and walking the second mile uncoerced. I suspect there would be fewer hungry people and even fewer living in positions of extreme wealth and power. In short, without the agenda of political religion, I suspect we would be a more Christian nation. War is difficult to justify from a strong ethical stance, as most ethicists know. 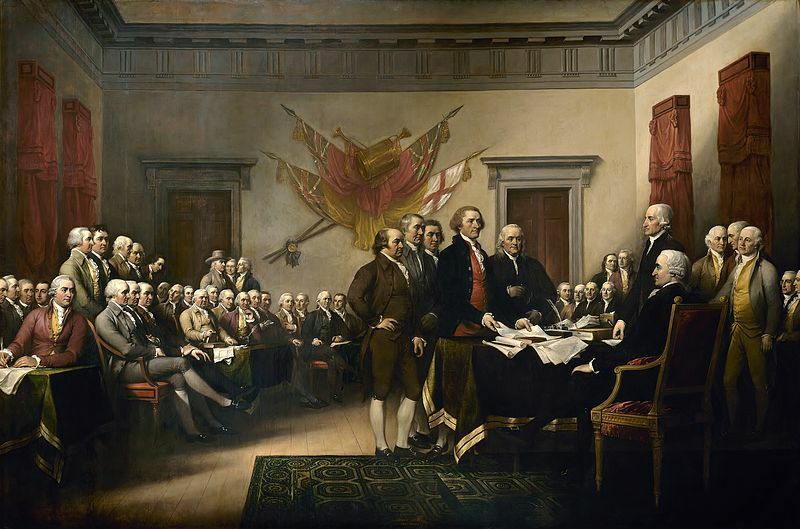 Our founders decided to go to war against what they believed was unfair oppression by a more powerful nation. This takes on the cast of a holy war because people were being oppressed. The pre-emptive strikes were throwing crates of tea into Boston Harbor, and yet the more advanced nation refused to lessen the pressure. In the Bible, Pharaoh declared the Israelites should make bricks without straw, and we all know where that got him. Or we would know, were we as literate as our forebears were. Freedom was considered a sacred trust. We live in a time when trust is at a premium. You can’t fly or surf the internet without being watched in intimate detail. There is no talk of holy wars, it seems, since the sacred has no place in a society that does not promote the concept of liberty with all the risks and benefits it entails. At a hotel during a recent excursion, I saw a National Geographic (I think) special on Gobekli Tepe (this is the fate of those of us kept from a daily sustenance of academic listservs bearing the most exciting news). Gobekli Tepe is an archaeological site in Turkey, discovered several years ago by Klaus Schmidt of the German Archaeological Institute. It is an odd site, dating back to some 11,000 years ago, that consists of megalithic (big stone) constructions earlier than Stonehenge or the great pyramids of Egypt, both dating from the Bronze Age, roughly. The complex of odd buildings seems to be religious in function because they bear no practical purpose, and the implications of the site are that our earliest steps towards civilization have been misinterpreted from the beginning. We have been taught that domestication of plants and farm animals led to fixed centers of living. 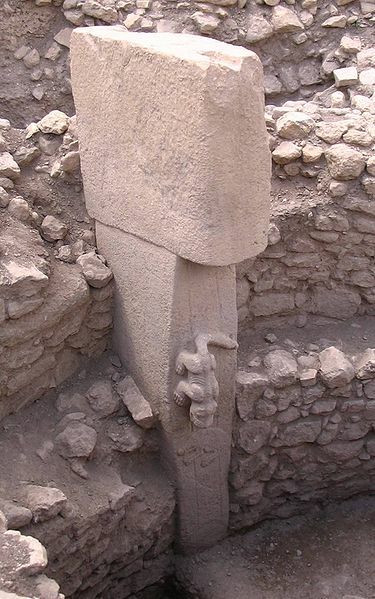 Gobekli Tepe suggests that religion led to settled life and farming came later. The implications of this are rather startling for those of us who’d been working on the assumption that religion developed as a way of keeping the gods happy after people had the luxury of surplus food brought on by agriculture. It turns out that hunter-gatherers learned to live in settled locations because of religion. That is, religion, instead of being just another component of culture, is what led to culture in the first place. In a climate where the most vocal intellectuals insist that religion must be shut down, chopped off at the roots, and burned in the oven of rationality, we see that none of us would be enjoying our urban lifestyles if religion hadn’t brought us together in the first place. There is no doubt that religion may be taken to extremes, and that when it is, it becomes dangerous. Religion, however, is no foe to rational thinking. Gobekli Tepe is a site of astounding engineering for Stone-Age hunter-gatherers. Engineering is applied science, and so these people were using their understanding of the world to establish a ritual site for the practice of their religion. They needed to live nearby, although they still had to spend their days chasing animals and gathering foodstuffs along the way. Religion made them realize that life together was a necessity for humanity to thrive. We should take a more balanced view before declaring religion a source of evil only. We may never be able to coax the gods into the laboratory, but that doesn’t mean that they don’t have a very important function for human civilization. If they are taken in reasonable doses, they might even lead to astounding transformations. Sitting in traffic outside the Lincoln Tunnel, I see that the Violent Femmes are coming to town. The billboard sends my mind spiraling back to college, when the Violent Femmes had released their debut album. Not that I ever listened to it (then), but in the fervently evangelical atmosphere of Grove City College, many students rooted and grubbed for any whiff of esoteric Christianity in a culture on the—pardon the genre-switch—highway to Hell. Rumors abounded that the Femmes were covert Christians, just like another up-and-coming band called U2. Not only the Femmes were violent—reaction to such Christianizing assertions was as well. I remember one of the dorm-mates in my housing group getting into a shouting match that U2 was not a Christian group and slamming his door to sulk, literally for hours. This was important stuff. We were Christians in an underground world. Of course, some of us knew that Gordon Gano clearly betrayed the influence of Larry Norman in his voicing. And there were rumors and rumors of rumors that the Violent Femmes were coming out with a Christian album, despite the popularity of “Blister in the Sun,” the homage to masturbation that raised the group to stardom. This rumor turned out to be partially true, as Hallowed Ground took on spiritual themes, a little bit country, a little bit soul. There was some tension in the group as Gano’s lyrics began to suggest something more overtly Christian. All of this was going on long before I discovered the Femmes. At Nashotah House I taught a guest lecture on Christian themes in rock music. 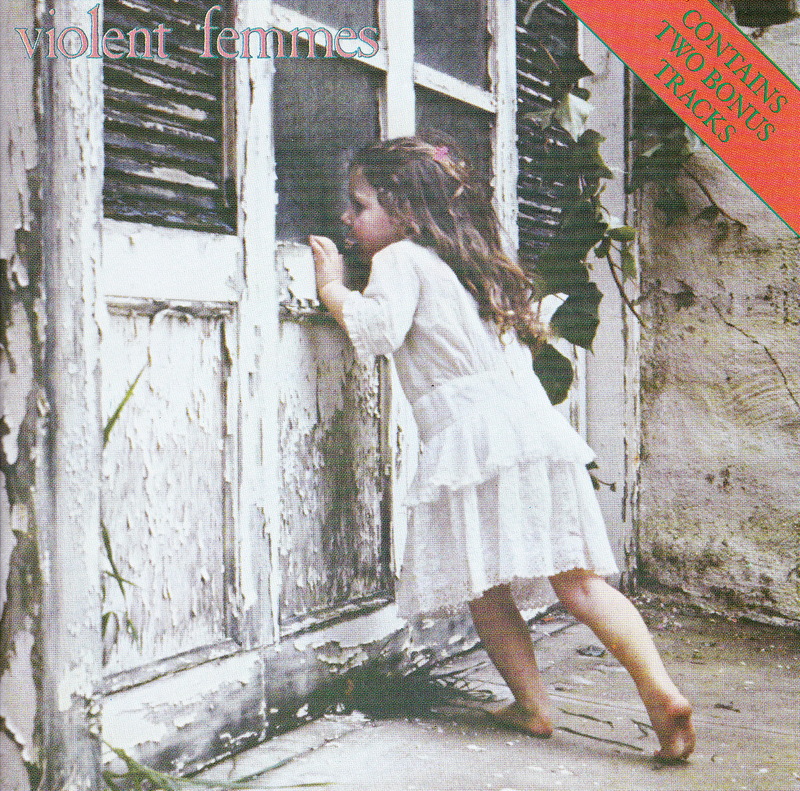 I researched the Violent Femmes and found that I liked their sound. They made the cut for the lecture. In a culture as deeply steeped in the Bible as ours, it is difficult to avoid Christian imagery altogether. The Femmes were from Milwaukee (not far from Nashotah House, as the raptor flies), the heartland where beats the pulse of unadulterated religiosity. Even Iron Maiden, after all, had released the platinum album The Number of the Beast. And David Buckna points out in a recent MuseMash post, that even Ozzy Osbourne has some religious aptitude. (I always thought there was more going on in “Iron Man” than meets the ear.) This may all be chalked up to cultural Christianity—there need not be too much conviction here. Those who feel oppressed, however, huddled together in their evangelical college dorms, will always suspect that there is something more beneath the surface that makes even the “Prince of Darkness” the bearer of light. Recently I was discussing the internet with friends. Real ones, I mean, physically in the room with me. One asked if the internet made conspiracy theories more believable. My response was that the internet has changed truth. That probably seems like a bold statement, I know. Truth, however, is an abstract very difficult to pin down. Science, for starters, does not deliver truth. Science is theoretical, and since it is falsifiable, a scientific theory, while based on facts, is always contingent; it is the best explanation that we have at the moment. Scientists generally know not to conflate this with truth, deferring the latter to the realm of philosophy. The average person probably conceives of truth as that which is literally real. Reality itself is, however, a very slippery concept—quantum physics reveals realities where many are not comfortable going, and which very few truly understand. Truth is a philosophical concept that reflects what humanity collectively accepts to be reality. It is in this sense that the internet has changed truth. It is the Wikipedification of the mind. People, for as long as they’ve had the luxury to consider abstracts, have struggled with the question of truth. 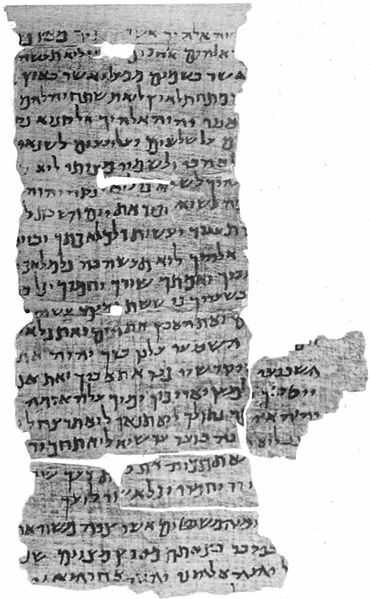 For a few centuries—almost a couple of millennia—in much of the western world, the Bible was considered a source of truth. If it was in there, it was true. The source of authority here was that of a deity who oversaw the writing of the Bible, word by sacred word. When science began to demonstrate that this Weltanschuung was untenable, people realized that truth was a bit more complex. When westerners came into contact with other religions, the complexity grew. Large swaths of humanity believed things completely different from the rest of us. What was the truth? A rear-guard action was often the result. Those who had the Bible had the truth already, and since truth doesn’t change, what more was there to be said. The internet is not yet a mature adult, but an entire generation has now grown to a kind of maturity with it. It is the first line of recourse for true information. Who has a phonebook in their house anymore? When is the last time you opened a physical dictionary? Some of us routinely look up Bible verses online, since the internet is the ultimate concordance. Instead of turning to the Bible, or any other source, we turn to the collective “wisdom” of humanity as the measure of what is true. Snopes aside, we plow ahead with what we read online, confident that with all those millions of users, we just can’t be wrong. How strange a concept to unplug and look at the actual reality behind the screen. We might be surprised to learn that there are great and terrible wizards back there after all. Sleek-headed men, such as sleep a-nights. I have no doubts that my symbolic gesture was overlooked and the chit summarily discarded as the detritus of a warped (i.e., liberal) mind. The act, however, had been done. Due to a booking accident, I once found myself flying first class. Those who know me will understand just how vexing this was for me. I fly quite a bit for work, and I am a populist through and through. Airlines set apart special bits of feet-darkened carpet for premium-class passengers to tread upon. They cordon off a special “lane” for the pampered class that is a nothing more than a matter of a jump to the left and a step to the right away from where those of us who wear last year’s (or decade’s) clothes board the same vehicle headed for the same destination and to which we’ll all arrive at the same time. I don’t disparage those who like receiving drinks while on the tarmac and hot towels to freshen up, and actual food on real plates while those of us before the curtain insist that there is no wizard hiding up there after all. I’m just not one of them. So I found myself in a leather seat with an entire cow’s worth of skin to myself. I had never been so kindly treated on a plane, with perhaps the exception of flying economy on Virgin Atlantic. I knew from the in-flight magazine that those behind me received only little pretzels and overpriced snack boxes while I was offered warm food and champagne. 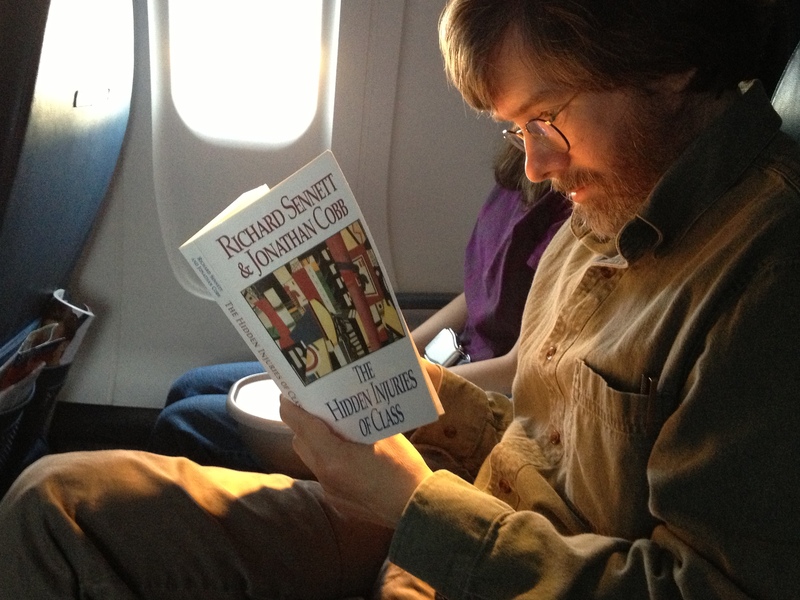 I pulled out my reading for the flight, The Hidden Injuries of Class by Jonathan Cobb and Richard Sennett. I’m sure nobody else noticed. But wasn’t that precisely the point? Hummingbirds, according to my bird book, have hearts that beat 1260 times a minute. That translates, if my math is to be trusted, to 21 beats per second. As the only birds capable of flying backwards, their aerial acrobatics are fascinating to watch as they hover, accelerate, and change directions like a biological UFO. During the summer they guzzle the empty calories of sugar-water that we leave for them in our feeders, so that we can lure them close enough to observe (that is, after all, how humans interact with their environment). The other day I watched a snapshot of developmental behavior. 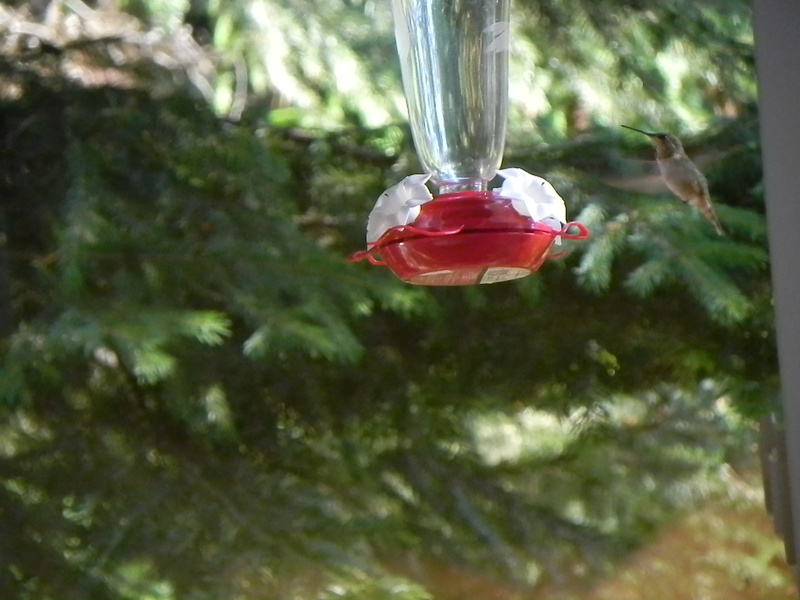 This July has been a good one for hummingbirds, with several a day visiting the local watering hole. I sometimes wonder about the flowers that are overburdened with nectar as these tiny birds hover by their communal font. At first it seemed that only one bird frequented the feeder. Then two came along, and although four feeding spouts were available, one would always chase the other away in a dogfight worthy of Baron von Richthofen. A third showed up, and when the first was busy chasing the second away, would fly over to the feeder to attempt a nip. Then a fourth. Eventually a fifth. And although there are four evenly spaced openings, only one took a drink at a time. “Bird brain” is a speciesist insult. Many birds are very intelligent and the comparison with human behavior is often apt. Protecting one’s private stash that is more than adequate for the community is worthy of comparison. Not to complicate speciesisms, but when a person prevents another from enjoying what one cannot, we call it being a dog in a manger (dogs, of course, do not eat the provender of the barnyard herbivores). A bird flying so fast that it’s a blur chases another away and cannot enjoy the high-calorie, human intoxicant we offer so that we can appreciate its incredible display. If we could fly like that, would we be so short-sighted? God-like, we attempt to make nature in our own image. And mix metaphors like a professional editor. Not far from the shelter of the human breadline we offer, hover the larger, predatory birds. Those who fly fastest, super-charged with sugar and spite, stand a better chance of surviving. And when a luxury liner encounters an iceberg in the frigid north Atlantic, those who’ve lingered longer at the feeder are better equipped to gain quick access to the lifeboats that are sorely inadequate for the overbooked cruise. And if I were on board, would I not be like a hummingbird in the manger? My heart beats 21 times a second just to think about it. Back in the days of The Scarlet Letter, and before, an even more egregious double standard afflicted the sexual practices of women and men. Our primate nature promotes two conflicting principles: disgust at cheating and the desire to get away with what we can. Unfortunately, biology has often showcased female infidelity with the “illegitimate” child, and religions have stood in line to condemn the behavior that led to such circumstances. I was reminded of this while looking at a “gown of repentance” at the National Museum of Scotland. The Scottish Reformation led to an unusually severe kind of Schadenfreude when it came to pointing out the faults of others. Janet Gothskirk, spiritual kin to Hester Prynne, was convicted of adultery and had to wear a “gown of repentance,” literal sackcloth, to humiliate herpublicly. Her partner in crime, William Murdoch, is not recorded as having received any punishment for the affair, according to the placard. Thus it has always been: boys will be boys, but girls will be good. And when it comes time to dole out the blame, well, boys sometimes just can’t help themselves. This double standard is still in widespread practice throughout the religious world today. It shares roots with the same thinking that leads to many major religions denying sacerdotal leadership to women, and to the unfair punishment doled upon women in cultures where their behavior “dishonors” that of the men-folk. And we have all seen where male leadership has steered this ship. 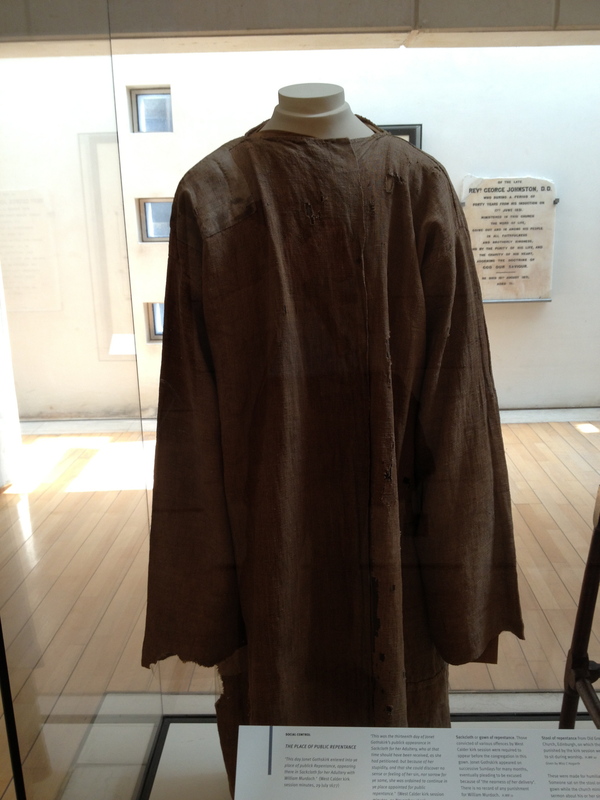 What struck me hardest, staring at the dirty, ratty garment of shame, was that forgiveness seems so far removed from the religion of the Reformation. Christianity has always claimed a basis in the concepts of love and forgiveness, but when it comes to the very real circumstances of human failings, the animal tendency to attack the weak is often the driving force. We deflect because deep down we know that we all have failings. Clergy and braggarts may sometimes claim otherwise, but we share this very common liability of humanness. We should try to help each other through it. We should remember the golden rule. We should remember that sackcloth was meant to be self-inflicted and that the role of the church was to absolve the guilt, not to showcase it. Janet Gothskirk is forgotten to history, save for the garment she once wore to display her weakness for all to see.